Synoptek blends speed, agility, and simplicity to minimize organizational challenges in scaling and managing information technology infrastructure, while effectively reducing costs. With access to best-in-class technology experts, toolsets, hardware, and software, Synoptek guides companies for a total IT infrastructure management solution. Synoptek provides comprehensive 24×7 monitoring and management along with supporting cloud hosting and multiple backup and disaster recovery scenarios under Service Level Agreements designed for each client. Synoptek’s Managed IT Infrastructure Services provide all of these features and more for a fixed monthly price. Synoptek takes a different approach, serving as a trusted advisor to its clients offering value, innovation, assurance, and integrity in every customer interaction. Synoptek’s managed services model optimizes IT system performance and reliability while creating a predictable and sustainable IT environment that proves cost-effective for our clients. IT services clients want one partner (not a bunch of vendors) to manage everything and that’s what we do. 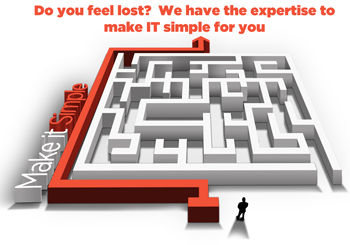 IT Advice and Consulting: Our skilled IT talent advises companies in a highly complex information technology environment where businesses are challenged to continue to manage their own technology. Our progressive solutions enable companies to grow their businesses for superior end results, taking a customer-first approach in everything we do. Our consultation time will leave you informed and ready to make the right choices at a cost that fits your budget. Project and Program Management: Synoptek recognizes your need for program and project management—to organize resources and drive activities to improve business results. We focus on increased productivity, forward innovation and measurable performance standards leveraging technology to improve business profitability. With a clear understanding of your objectives, we manage the planning, implementation, and coordination of your project details, program management, business systems, website and application development, and IT infrastructure. IT Management and Support: Our responsive IT management and support services are based on a solid investment in advanced IT toolsets and skilled IT professionals. We provide exceptional value and innovation using the best IT service management platforms and ITIL-based processes to provide cloud hosting, IT infrastructure monitoring, and 24×7 help desk support services for increased productivity and simplified IT. Cloud Hosting Services: Providing more than just rackspace and power, hosting services in our global datacenters offer redundant connectivity and customizable backup and disaster recovery solutions. Secure, scalable, reliable, virtual—the Synoptek cloud services package is a must-have for uptime, optimization, and mobility. With fully scalable options and predictable costs, the Synoptek cloud solution is a way for companies to re-acquire focus on business objectives. Learn more about the outsourced public, private, and hybrid cloud hosting options to grow your business. Application Services: Synoptek ensures optimal performance for your application tiers: web, middleware, and databases. Our application management services support custom, off-the-shelf enterprise solutions with service level agreements based on client criteria. Minimize IT spending, reduce cost of ownership, and improve reliability and performance with the Synoptek software as a service (SaaS), database administrator (DBA) virtual desktop infrastructure (VDI), and Exchange hosting solutions. Comprehensive IT Outsourcing: With the Synoptek IT outsourcing model, companies experience cost savings, standardized operations and efficiencies, and simplified IT management and support using our ITIL-based approach. This approach promises organizations a level of service management for IT systems, business processes, staffing, and leadership. Synoptek aligns with the size and complexity of your business to deliver the best value in the market today. Is IT as a Service (ITaaS) a good fit for your company? Is it becoming harder to find and retain skilled IT professionals? Is the number of sites, devices, systems and users increasing? As everything is expanding, is your ability to manage risk, security and compliance also growing? If you accept that your IT infrastructure is critical to your company and that the management of that IT infrastructure is equally important, then you want to establish a relationship with a provider like Synoptek that will be a partner with you, and not a faceless vendor who just sells commodity solutions.